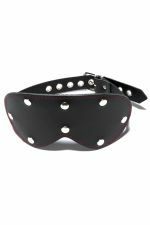 Leather blindfold with elastic strap. Leather cat mask with elastic strap. Leather blindfold with adjustable buckle closure. Leather Cat Mask with adjustable buckle closure. Ultimate leather hood with detachable blindfold and mouthpiece. Adjustable lace up back. Deluxe leather lycra hood with leather front and lycra back.